Gardening is a lot easier when you use a gardening stool with wheels to sit on. Although the garden kneelers with handles we looked at can be a great help it is even better to use a garden stool that has wheels and a seat to sit on. When you get a little older is harder to get on your knees and pull weeds or do any other type of gardening. It was not easy to find the better rated garden stools to sit on that also had some decent number of customer reviews but I found a few that I think are worth having a look at. Remember that these are just a few of the brands and models available and it is always best to do your own research also even if you follow my recommendations for garden stools for seniors. 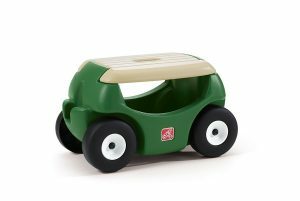 This garden hopper is a very popular gardening stool with wheels and comes from the Step2 company. We found an average of 4.5 stars from almost 1150 customers who took the time to write a review. Under the seat is a nice storage compartment and for your gardening tools and gloves or even a cold beverage. The dimension are 12.5 inches high, 23 inches wide and 13 inches deep. The weight is 9 Lbs. The weight that this garden stool with wheels can carry is 250 Lbs. After reading a lot of the reviews that came from people who really use this garden seat I can only confirm the rating we also think it deserves. Click here or on the picture to find the price for this garden hopper. The Suncast GDS200D garden scooter does not get the high ratings as the garden hopper but is still getting a 4.2 star rating average from over 500 people who bought and uses this garden scooter with seat. This gardening stool with wheels has a seat that can be removed and used as a kneeling pad. The cushion is made from a good quality foam. The included 2 holders for drinks on the front is a nice feature in my opinion. the 4 colors that the pad is available in makes it easy to find one that fits your style. The bin inside is large enough with its 8.5 gallon to store some of your gardening tools and your gloves or other items. The strap to pull this cart makes it very easy to pull this cart around the garden to the place you like to sit down and do your gardening. Click here or on the picture to find the price for this Suncast garden cart with seat. Fist I was planning on skipping this garden cart because or the lower ratings but after spending some time reading to a number of reviews I decided to publish it and let you judge it for yourself. Reason is that some people gave it a low rating and other ones are totally happy with it and gave it a high rating. Lets have a look at the dimensions first to see if this gardening stool with wheels will fit your needs. Length – 40 inches, Width – 18 inches, Height – 22 inches and the total weight is 32 Lbs. The weight it can carry is up to 225 pounds. The wheels have a 10 inch diameter and are pneumatic just like your car is. This cart is little higher priced because of the used powder coated steel. The features are a 360 degree swivel chair to enable working from any angle you like. There is a basket on the back that you can use to carry your garden tools, beverages or gardening gloves with you. Available in the colors Blue, Red and Green to fit your personal preference. The steering wheel can be extended to make is easier to move around. Reason for the lower rating is the fact that I read a few bad things about the quality and the durability of this garden cart with swivel seat. There are quit a few people who complained about bending axles. But to be hones there were more complaints about parts missing in the package and poor packaging in general. Click here to see the price of this garden cart with wheels and swivel seat. 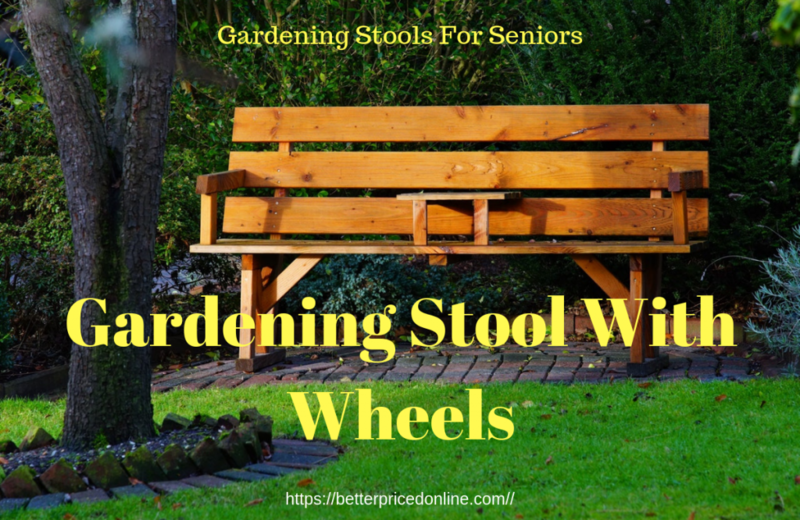 I believe that one of these gardening stool with wheels can make gardening for seniors or people with a handicap a lot easier and maybe even enable them to do gardening again. Walking around with garden tools from spot to spot can be very hard. If you like to go for a cheap garden kneeler or a kneeler with handles or even a garden stool with wheels is something you have to decide on yourself. I like these carts with wheels but they take up more room to store and might also need some maintenance. The fact that you can sit on them and slowly mover around the garden is in my opinion a big plus and so much easier than moving around on one of the foam kneelers that most of us use or have used. I hope my writing and research of the gardening stool with wheels helped you find the product you looked for. Please give us a like on our Facebook page and if you have an opinion feel free to leave it in the comments.